Tim Herron leads the Pebble Beach Pro-Am by a shot entering today's third round. PEBBLE BEACH, Calif. » Desperation slowly gave way to satisfaction for Tim Herron yesterday in the AT&T Pebble Beach National Pro-Am when he shot a 3-under 69 at Poppy Hills and emerged with a one-shot lead in a tournament loaded with possibilities. Herron was at 7-under 137. The cut won't be made until after today, when the 180-man field has played all three courses in the rotation, but one look at the muddled leaderboard makes it perfectly clear what Herron is talking about. A 12-foot birdie putt on his final hole at Poppy gave him a one-shot lead over four players, including FBR Open winner J.B. Holmes. PEBBLE BEACH, Calif. » Tim Herron was so frustrated that he changed putters for the first time in seven years at a tournament renowned for having some of the most unpredictable greens on the PGA Tour. Desperation slowly gave way to satisfaction yesterday in the AT&T Pebble Beach National Pro-Am when Herron shot a 3-under 69 at Poppy Hills and emerged with a one-shot lead in a tournament loaded with possibilities. "Everyone who makes the cut is going to be right in the tournament," said Herron, who was at 7-under 137. A 12-foot birdie putt on his final hole at Poppy gave him a one-shot lead over four players, including FBR Open winner J.B. Holmes and Nicholas Thompson, who was tied for the lead until missing a 20-inch putt on No. 8 at Pebble Beach, his 17th hole. Holmes was fortunate to stay within one shot after his tee shot on the 18th at Pebble Beach dropped into that big water hazard left of the fairway known as the Pacific Ocean. He took a drop, belted a fairway metal onto the green and two-putted for par. Jason Day, the 20-year-old Australian and youngest member of the PGA Tour, had a 70 at Spyglass Hill and was among a half-dozen players at 5-under 139. Three dozen players were within four shots of the lead, including Punahou alumnus Parker McLachlin, who shot a 70 at Spyglass Hill and sits in a tie for 12th, three strokes back. 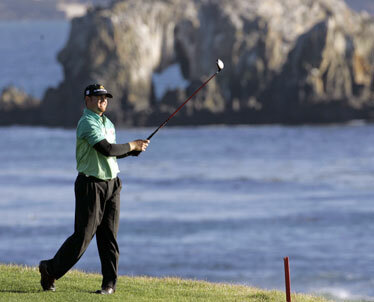 Castle graduate Dean Wilson shot a 73 at Spyglass and was well back at 148. Tadd Fujikawa, a Moanalua junior, followed up his opening-round 72 with an 81 at Pebble Beach to trail by 16 strokes. 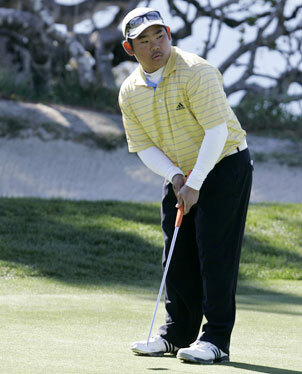 Fujikawa will try to make the cut playing Poppy Hills today, while McLachlin and Wilson will play Pebble Beach. Also struggling a bit was defending champion Phil Mickelson, who played his final 11 holes at Spyglass with no birdies and three bogeys for a 72, although he still was in range at 1-under 143. "This is the round that could've been," Mickelson said. "I really could have had it going. I had a number of birdie opportunities to be well under par and just gave it away." Mickelson joins the movie stars and corporate VIPs at Pebble Beach today, when the tournament might finally take shape. "If I shoot a good round tomorrow ... at Pebble, you can shoot 6 or 7 under and get back in it, and that's what I need to do," he said. But those rounds have been hard to find. J.B. Holmes' drive on 18 yesterday went into the Pacific Ocean, but this approach reached the green and he two-putted for par. The peninsula has rarely been this majestic for the AT&T, but those blue skies have been accompanied by a cool, stiff breeze that has made scoring higher than unusual. Ryan Palmer has the best score at Pebble this week, a 65 that was 13 shots better than his opening round. Davis Love III was disappointed when he walked off Pebble Beach with a 71 until he looked at the leaderboard behind the green and realized his 3-under 141 was right in the mix. "It's harder than you think," Love said. "The ball isn't going anywhere." He left a number of iron shots well short of the hole to limit his birdie chances, but playing for the first time in four months because of ankle surgery, he had no complaints about the way he walked or played. Love has two months to qualify for the Masters, and if he could finish in the top four, it might be enough to qualify for the Accenture Match Play Championship in two weeks. "I've got to look at the positives," he said. Robert Floyd catches himself looking at the past when he gets to Pebble Beach, primarily because his name is in bronze on the wall of champions leading up to the first tee. "That's my claim to fame among my friends, that I won Pebble Beach," said the 32-year-old son of Raymond Floyd. "I don't really tell them it's the amateur portion of it." Floyd, who entered play today a stroke back, was a teenager playing with Dudley Hart when they won the pro-am in 1994, the year Johnny Miller won his final PGA Tour event at age 46, by one shot over a group that included Tom Watson. Floyd had a solid amateur career but has yet to make it to the big leagues. Even though he earned his real estate license and still works a few days a week, he has not given up on his dream. Floyd played the mini-tours last year, failed to advance through Q-school, but received a sponsor's exemption to Pebble Beach. He also is playing next week at Riviera on an exemption. He opened with a 68 at Pebble Beach, then followed that with a 70 at Poppy Hills. "To come out here and be able to perform is really exciting," Floyd said. "It's only two rounds. I knew I was playing well enough to do this. I didn't know if I was going to be able to handle my nerves well enough to play. So far, I guess, good enough." But there's still a long way to go, and so many players within striking distance of the lead. Tadd Fujikawa missed this birdie putt yesterday on the fourth green of the Pebble Beach Golf Links. He made his par putt. BOCA RATON, Fla. » Mark McNulty holed an 86-foot chip for eagle on the par-5 18th for a 6-under 66 and a share of the first-round lead with Jerry Pate in the Champions Tour's Allianz Championship. Pate, coming off a victory two weeks ago in Hawaii, missed an 8-foot birdie attempt on the 18th moments after McNulty's eagle. 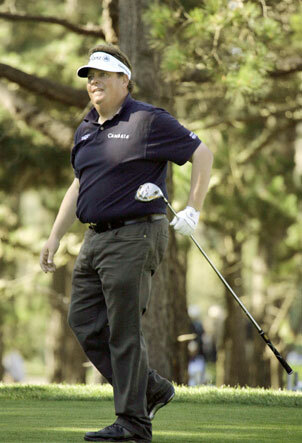 Jay Haas was at 67 along with Bobby Wadkins, Tom Purtzer, Scott Hoch, Keith Fergus, Gil Morgan and Phil Blackmar. Defending champion Mark James was four shots back after a 70. NEW DELHI » Ireland's Damien McGrane shot a 3-under 69 to take a two-stroke lead after the second round of the inaugural Indian Masters. McGrane had an 8-under 136 total on the Delhi Golf Club. South Africa's Hendrik Buhrmann, France's Raphael Jacquelin and Northern Ireland's Graeme McDowell shot 69s. Ernie Els followed his opening 75 with a 70 to make the cut by two strokes. GOLD COAST, Australia » Australia's Nikki Garrett holed a 118-foot bunker shot for eagle on the par-5 fifth and finished with a 5-under 67 to take a one-stroke lead after the opening round of the Australian Ladies Masters. Garrett, the 2006 Ladies European Tour rookie of the year and winner of consecutive tournaments last year in Spain, had two birdies on the back nine at Royal Pines. Six-time champion Karrie Webb opened with a 69. The tournament was reduced to 54 holes after rain washed out play Thursday.